Please schedule a New Patient Visit + Acupuncture using our online appointment system by clicking the button to the right, or you can call us at 206-771-7982. Please download our New Patient Forms and bring them completed to your first appointment. Alternatively, plan to arrive 20 minutes before your appointment time to fill them out in person. Your first visit intake will be in a private room where your acupuncturist will give you a brief orientation to the clinic, discuss your primary concerns and goals for treatment, and give you a treatment plan along with an estimate of what kind of progress you can expect from acupuncture. After our initial chat, your acupuncture treatment will begin in our peaceful group treatment room. Most people get between 8-16 needles at each visit, but that can vary depending on the person and the condition. Once the needles are in and we make sure you're comfortable, your job is just to relax and enjoy the space. We take care to make our space tranquil and soothing. We play soft music and have blankets and pillows for your comfort. Most people relax deeply and fall asleep. Plan to wear comfortable clothing that can be pushed up to your knees and elbows. Be completely scent-free, we treat people with allergies and asthma. Generally, your appointment will be about 1 hour with a few extra minutes on the first visit. 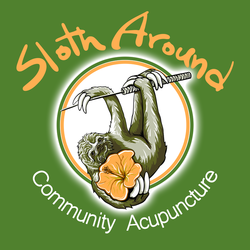 We generally recommend two acupuncture treatments per week for the first two weeks for most conditions, reassessing frequency and progress after the first week or two . Click here to learn more about frequency of visits. We have soft music playing in our treatment room. If you would like to listen to your own music or guided meditation feel free to bring your own with headphones. Alternately, if you would prefer a quieter session, some folks bring their own earplugs. We charge $20 to cancel appointments with less than 24 hours notice, and for all missed visits. If you have a prepaid visit card, the fee will be collected by deducting a visit from your card. We schedule patients every 10 minutes, we ask you to be responsible for being on time. We always try to accommodate if you are late, however if you arrive more than 20 minutes late, you may need to reschedule at your own cost. We are a SCENT-FREE CLINIC. This is for the health and safety of our patients who may have multiple chemical sensitivities (MCS), allergies, asthma, or other respiratory illnesses. If you come with perfumes, scented personal care products, after shave, fresh smoke, incense, or wet nail polish you may be asked to reschedule. Lastly, we kindly request that you are mindful to keep noise to a minimum and to use a soft voice.